Well friends, we have reached the end of the Halloween posts and today I am finishing up with one of my favorite things that I have done to decorate for Halloween this year. 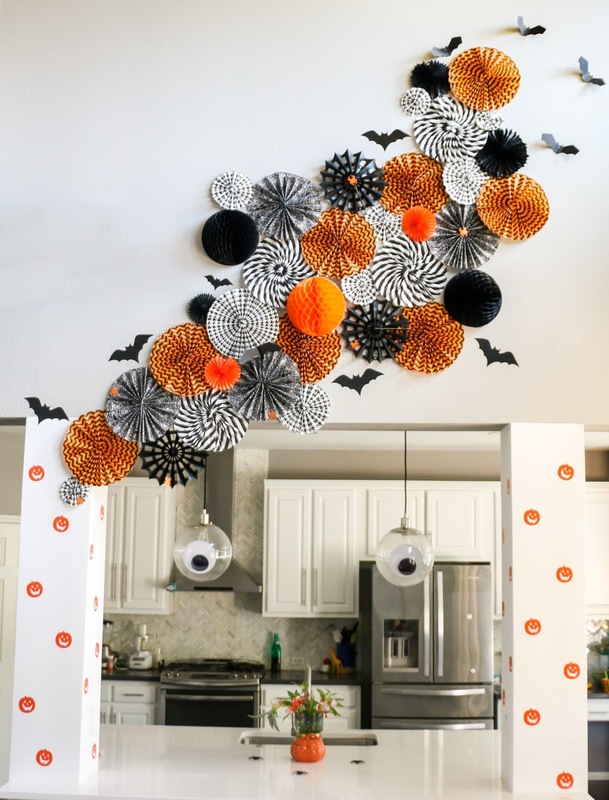 I used mainly paper fans that I DIY’d using paper napkins to create this visually stunning and large scale Halloween art wall in the blank space above my kitchen. As I mentioned the main component of this wall are paper fans that I folded out of paper napkins. 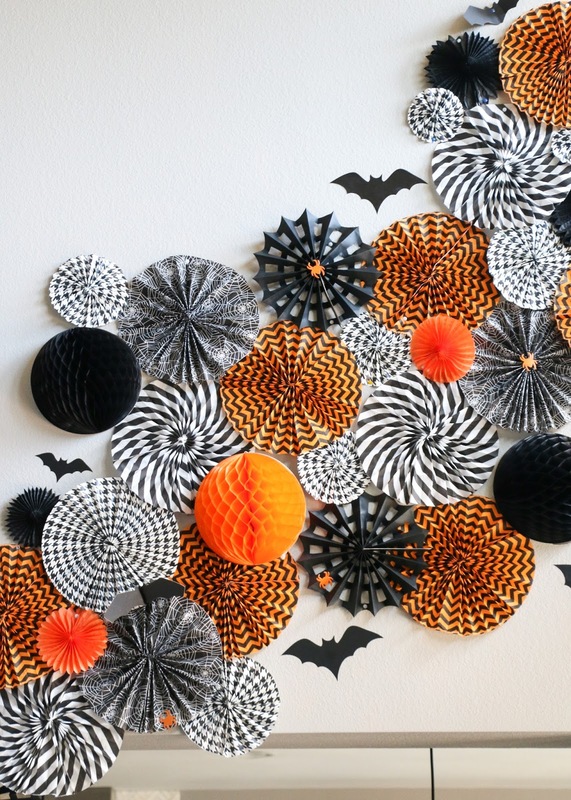 The orange zig zag and black and white napkins were from the Target dollar spot at $1 for 12 napkins which made 6 fans, and the black and white spider web napkins were from Michael’s craft store at 20 napkins for $2.99. 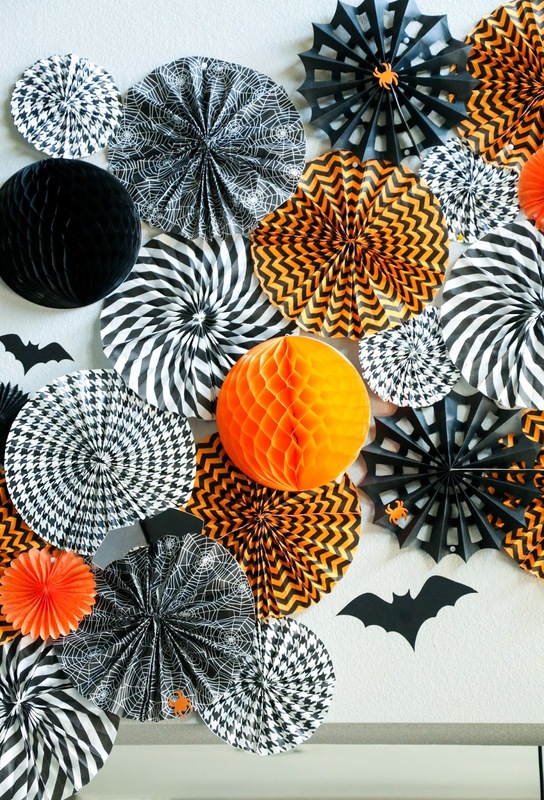 The black and white hounds tooth paper fans were made using the same technique, but with wrapping paper instead (I already had this on hand from a few years ago). 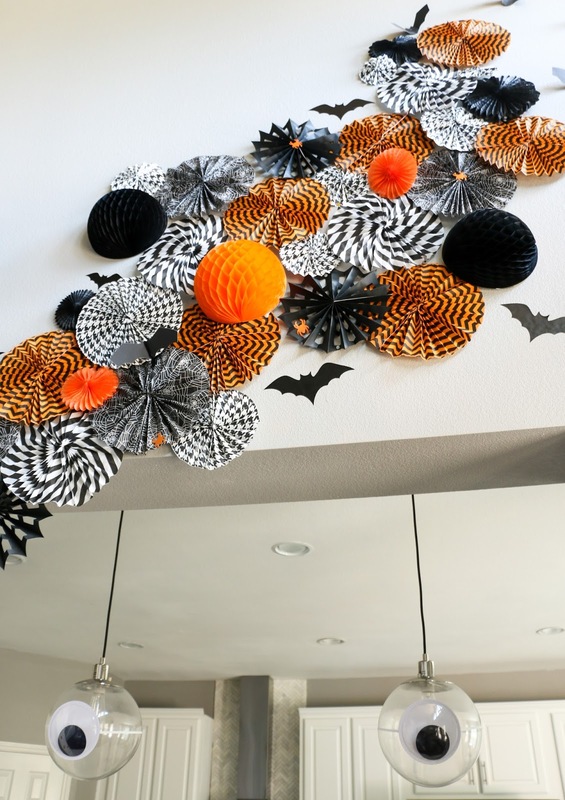 To add a bit more visual interest and break up the paper fans a bit, I added store bought solid paper fans in orange and black, spider web paper fans from Michael’s ($2.99 for 3 of them), and black and orange honeycomb balls that I only opened half way so that they would adhere to the wall (these were from Target’s party section for around $2 each). The final touch to top off the Halloween art wall are bats! I used a few vinyl bats that I cut out using my vinyl cutter as well as a few 3D paper bats that my sister traced and cut out of black poster board. I positioned the bats around the paper fans with a few flying out of the top of the instillation to make it feel alive and as if this is their nest and they are flying out for the night. I am so happy with the way this turned out, and if you are keeping track, this entire thing cost me under $20! Yes, that is right, stunning and budget friendly! And as my friend pointed out, completely on theme for my daughters Halloween origami party. Paper folding for the win! And by the way, I am already planning an equally spectacular Christmas edition of this because I just can’t get enough of the awesomeness!